← Ghirardelli Pumpkin Spice Squares, so glad I didn’t discover these sooner…. Fluff, what’s not to love? 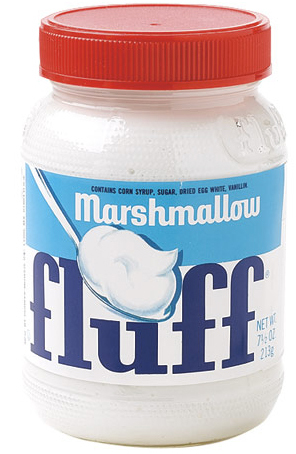 Fluff, is one of three varieties of marshmallow creme made in the U.S.A., and I believe that it’s the best. I grew up in the Boston area, and thought that everyone had this in their cabinets. It’s a staple of grade school lunches up and down New England. I couldn’t find the stuff when I moved west, and I started having a serious hankering for a Fluffernutter Sandwich. For those of you who don’t know, a “Fluffernutter” is a peanut butter and Fluff sandwich. It will send you into a sugar coma, but it’s soooo good. I suggest making half a sandwich for your first try. I’m sure that purists would insist on making one with Wonder Bread, but I actually prefer mine on a good wheat bread, since the white bread tears so easily. Here’s the official Fluff web site. Here you’ll find all sorts of trivia and a store locator to find the hallowed stuff. You can even order a case online if you so desire. It does come in Strawberry and Raspberry which I think are abominations to the original, but if you like ’em, good for you. They actually might work in making yummy frostings…. There is even a Fluff festival in Somerville, MA called….wait for it….What the Fluff. Check out the undying love for this product! I have found Fluff at Cost Plus/World Market. It’s always good to have on hand. I don’t know what the shelf life is, because as soon as it’s opened, it’s gone. Here’s a “Fluffy Marshmallow Cream” recipe from the food network, it sounds delightful. Let me know if you have other ways that you like to enjoy it.